We invite you for a stroll around Berlin, the dynamically developing capital city of Germany, with the panoramic map in hand. It was drawn with a pen and in ink and watercolours by the Armenian artist - cartographer Ruben Atoyan . Step after step, street after street, for many months he was crossing the quarters of this city with his sketchbook and rapidograph in hand. He stopped in front of the buildings and with investigative accuracy he was drawing facades of offices, historic buildings and the backstreets of the city. He devoted thousands of hours of laborious work to illustrate all the details of this German metropoly. The unique bird's eye view covers the area of 34m2 of Berlin. 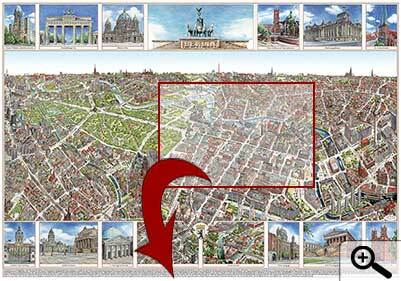 It has been the first panoramic map over the last hundred years, that shows Berlin to the changeable scale of perspective. The last work of this kind was edited in 1900. It is the first panorama on which both districts of East and West Berlin, that used to develop separately for many years, are shown as a whole. On separate sheets, inside the panorama you can find in a great close up the greatest attractions of the capital such as the Island of Museums and Western Centre. Now, when computers are designing perspective models of the city, this hand painted panoramic-map became a unique document of the city landscape at the beginning of the 21 th century. The mastery of the artist can also be admired in the rich ornamentation of the panorama. This ornamentation graphically depicts important events from the history of Berlin and Brandenburg as well as the important monuments at the Unter den Linden Boulevard. The panoramic - map is available in the poster version in a protective tube and in the folded versions. The folded version, so called souvenir (Souvenirkarte), is available with a magnifying glass provided, which allows one to investigate thoroughly the details. 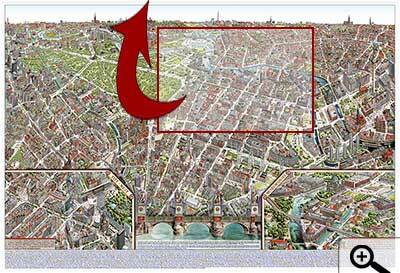 The second folded version, which consists of panoramic map and the detailed map of the centre of the city in scale 1:17 000, is very helpful while visiting the capital of Germany.